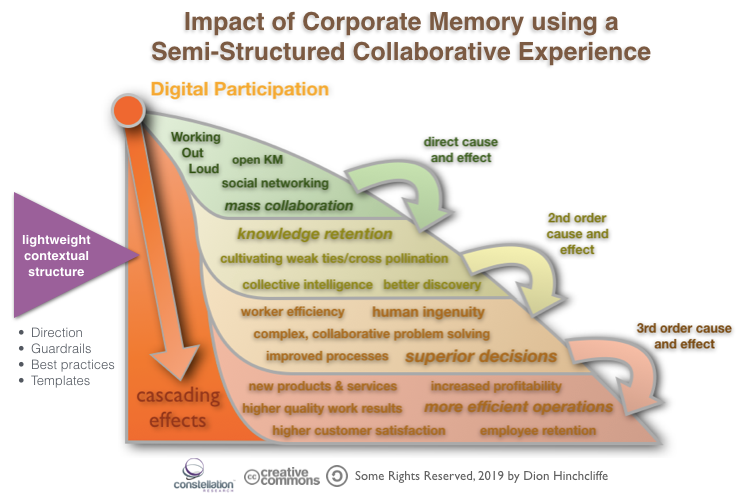 Corporate Memory: The Long-Term Value of Co-creating Knowledge With Employees | Constellation Research Inc.
Any organization today is the sum of its ever-more digitized parts. Efforts to digitally transform these parts into a more tech-enabled whole is currently at the top of corporate objectives globally. Yet of these elements, it is our workers that are arguably the greatest asset and motive force that we possess in our organizations. In today’s knowledge-driven economy, it’s what our workers know and how effectively they work together to apply their experience and insights that matters most. About 10 years ago the emergence of the digital tools of mass collaboration — specifically enterprise social networks and online communities — proactively brought together these a more holistic and open view of working together more explicitly onto digital platforms that would enable better business results and to do it at scale. By using these powerful new types of digital platforms, we found that organizations could capture knowledge more transparently and automatically as work took place. People and experts could find each other and collaborate more dynamically. Workers could more easily share ideas with less friction and more context, leaving a corporate memory behind that others could consult and re-use. But it was just a good start. We also found that part of the challenge of digitizing the knowledge of our organizations this way was that the ideas behind the enabling tools came from consumer social media. These consumer tools were very free form and undirected, letting its users go in any direction they chose, when instead in the enterprise, we’re often trying to complete a specific and well-known task. It’s taken years of experience and refinement to learn that an entirely undirected approach to collaboration isn’t always the most effective way of digitally collaborating. Certainly, the tools of mass collaboration have greatly improved transparency, reduced friction, and made it easier to carry out knowledge work. But this open-ended and freeform nature means they also tend not to specifically guide workers when they need it to get their jobs done. Employee On-boarding - Onboarding is generally a predictable process but it should vary considerably and be personalized based on the unique nature of the worker being onboarded. Workers being onboard can learn from corporate memory, while the mass collaboration tool can provide lightweight structure to the process, even allowing it to be carried out in the order the worker prefers, while providing content recommendations and early integration with their team members to speed up the process. Templates can be provided based on role that can accelerate the process and learning management systems can be integrated for faster learning and development. Customer Service Ticket Escalations - While trouble ticketing systems are competent at looking up the resolutions to common customer problems, tier 2 and 3 issues usually represent unique situations that require collaboration by workers in various groups to resolve the issue. These ticket escalations greatly benefit from the open problem solving that can elicit solutions from experts in unexpected corners of the organizations. The identify of experts good at solving special classes of issues also become part of corporate memory and can be more easily found in the future. Company-wide Knowledge Base - When there is structure to corporate knowledge capture, it can be turned into a knowledge base more consistently and easily. In fact, many organizations have used community managers as librarians to help organize corporate memory into a more easily accessed, searchable, and discoverable format. However, with some light structure, common types of knowledge (How-Tos, checklists, project templates, and numerous other types of easily re-usable information) can be systematized so that it can readily be found, analyzed, and reused. There are just three of many types of digital work that can benefit from a better structured and directed corporate memory. Co-creating knowledge with workers is one of the most powerful form of collaboration yet invented, resulting in an average 25% productivity gain across the board according to MIT Sloan Management Review. yet the right platforms and knowledge sharing culture must be established that have the basic foundation in place. It’s an exciting and promising time as mass collaboration matures into the leading way of carrying out knowledge work, now most organization need to take advantage of the recent lessons learned to maximize their results.